Each day throughout November there will be a blog post here with a daily theme. There will be a quote, a Bible verse, some questions, videos or blog links to get you thinking and inspired and a technique challenge for those who wish to take it on. There are guest posts during the month. There's a Flickr group and a Pinterest board. There's an InLinkz at the end of each post for you to link your work. It's a text link so it will only show your name. There will be a PDF to download every day. There will be a post everyday through November on Newly Creative so that you can see how I have done my page. And there's a post there tomorrow where you can see what journal I decided to make. There will be a post here next Wednesday with any other thoughts I've had during the next few days which may help you during November. I won't be giving you a supplies list. I suggest you use the inks, sprays, paints, stamps and papers you already own to make the journal truly yours. When you look at my pages on NewlyCreative they are there solely for inspiration, not for you to copy. I use a lot of Dylusions products but you don't have to. Use what you have. Some of the techniques may not work in the same way with different products but it doesn't matter. It means your journal will be unique to you. Remember the rule: this is your journal and you do it the way you want to. There are no other rules! Oh, sorry there IS another rule! 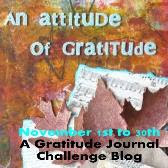 See you next Thursday for Day One of An Attitude of Gratitude Journal Prompts and Challenges. And don't forget to pop in here next Wednesday for any updates.